A Birmingham, Ala., couple couldn’t believe their luck when a larger townhome down the street came up for sale. 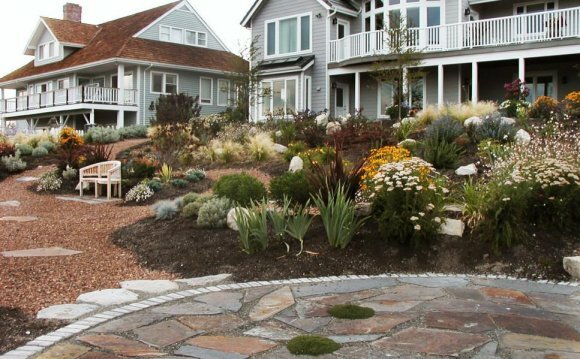 Before moving, they wanted to have both the new front yard and new backyard redesigned and landscape plans drawn. The busy professional couple were not gardeners, so low maintenance was a priority. They wanted year-round good looks, so evergreens were sure to be part of the solution. In the front yard, previous owners had taken the shrubs with them, leaving only a dogwood tree, small pane of grass, sidewalk, driveway and mailbox — practically an empty slate. Alongside the driveway, a line of evergreen holly, Ilex crenata ‘Soft Touch’ (zones 5-9), was chosen. Growing only 2 to 3 feet tall and wide, it will not interfere with passengers getting out of cars, will need no pruning, yet separate their front yard from the neighbor’s. At the beginning of this low hedge, behind the mailbox, a specimen of Calamagrostis x acutilfora ‘Karl Foerster’is planned for interest. After having been presented with a plan for retaining an existing dogwood, adding camellias as foundation plants under the front window, and soft touch holly to border the driveway, the owners decided they wanted more privacy and something different from the rest of the townhomes on their street. They retained the services of an interior designer and had a patio of precast pavers built across the front of the townhome with a low wall on two sides. This created a place for the owners to relax sheltered by the house from the hot afternoon sun. They insured their privacy with a row of closely planted arborvitae across the front and along one side the patio. They kept the camellias as foundation plants. Along the driveway bordering the neighbor, the owners chose to plant taller oakleaf and Mary Nell hollies rather than lower soft touch holly and the ornamental grass.